How much will pump efficiency be affected with the addition of a variable speed drive? It is a misconception that adding a variable speed drive (VSD) to a pump will increase its efficiency. When considering the wire-to-water efficiency of the pump, motor and VSD, each component that is added lowers the wire-to-water efficiency at a respective flow rate because each component has losses associated with it. 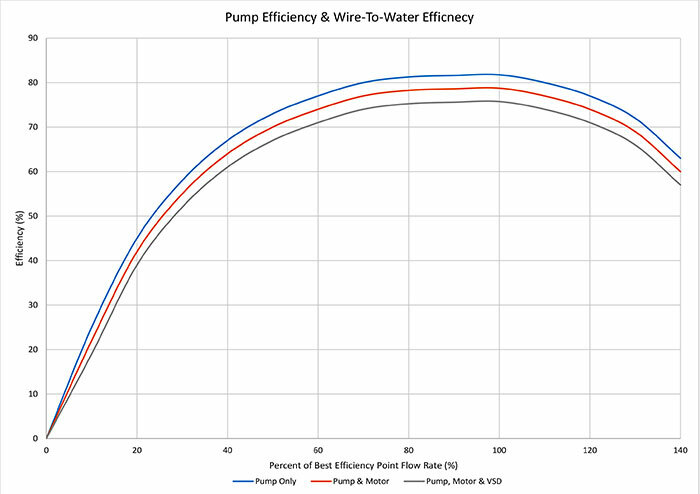 Image 1 illustrates this concept showing the pump efficiency being the greatest, then the wire-to-water efficiency decreasing at the respective flow rate when the motor and VSD are added to the extended pump product. The advantage that the VSD brings to the picture is that it can control the speed of the pump to meet the requirements of the system, which can reduce power consumed by less efficient controls that is not an essential requirement of the process. Additionally, the VSD can be used with on-off controls so the pump operates at a minimum speed where the specific energy consumption is optimized. 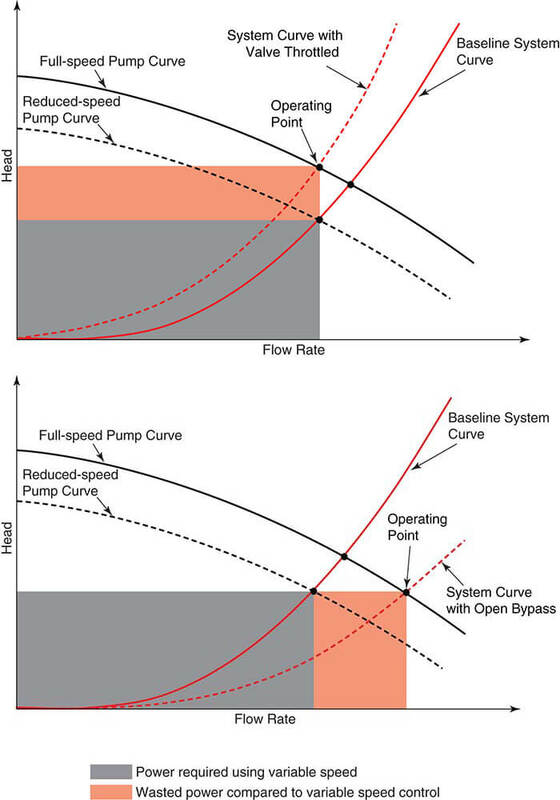 Based on this, the VSD potentially increases the entire pump system efficiency by eliminating wasted head across control valves and wanted flow through bypass vales, and in some instances allows the pump to operate closer to its best efficiency point (BEP). Image 2 illustrates two examples where the gray box represents power that is essential to the system and the orange box represents power that is not essential to the system. The orange box shows how much energy is wasted by throttling control in the first image or bypass control in the second image. In each case, the reduced speed pump curve can satisfy the operating flow without the orange wasted control power. The wasted control power typically outweighs the slight decrease in wire-to-water efficiency of the extended product. The two examples in Image 2 show systems with all friction head, and it is understood that the potential variable speed energy savings will decrease when static head is introduced to the system curve. For more information on variable speed pumping and the application and efficiency considerations, refer to HI’s Application Guideline for Variable Speed Pumping at pumps.org.